Are you a blacksmith? Have you wanted to be one? 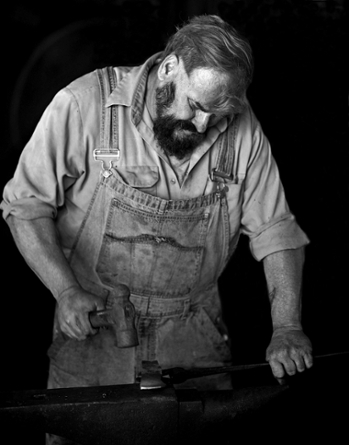 The first Beaumont Blacksmiths Association Meeting will be held on Sun., April 28 at Spindletop Gladys City Boomtown Museum on Lamar University. While this meeting will be an organization meeting, subsequent meetings will host specialized blacksmiths such as those in architectural blacksmiths, bladesmiths and more. Participants will have free admission to the museum on the day of the meetings, which will be held the last Sunday of every month. Organizer Rob Flurry is the resident blacksmith at the museum and has more than 40 years of experience in the blacksmith trade. He has been featured in a documentary titled “Blacksmith,” as well as in Texas Monthly, advertisements such as Full Throttle Energy Drink and even music videos. “Participants will have access to the shop equipment and will learn various types of blacksmithing skills. This group is for anyone who might have just an interest all the way up to master blacksmiths,” Flurry said. Spindletop-Gladys City Boomtown is a replica of the boomtown that grew up around the Spindletop oil fields in the early 1900s. The entrance fee is $5 for adults, $3 for senior citizens and $2 for children under 12. Spindletop Gladys City Boomtown Museum is located on the corner of Jimmy Simmons Boulevard and Cardinal Drive on the Lamar University campus. The museum is open Tues. – Sat. 10 a.m.-5 p.m. and Sun. 1-5 p.m. For more information, please call 409-880-1750, visit https://www.lamar.edu/spindletop-gladys-city/index.html or email gladyscityinfo@gmail.com.